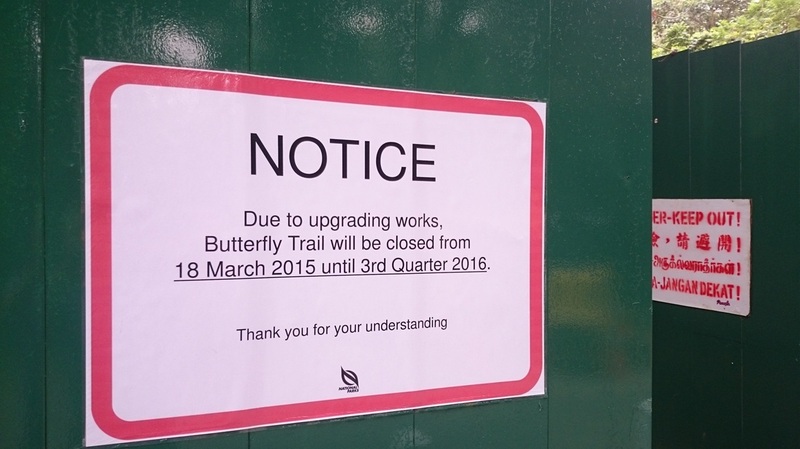 As you are aware, the above picture posted at the now-closed trail head stating that Butterfly trail will reopen in 3rd quarter 2016 is a smokescreen (previous notice read 3rd Quarter 2015) . The mountain biking community faces the dire possibility of losing recreational access to Butterfly trail for good. The trail is currently closed due to the construction of Chestnut Nature Park, and its future status to recreational use is unclear at this point of time. Nparks has announced to our association that they intend to close the trail to all recreational use upon the completion of the mountain bike trails at Chestnut Nature Park. This came as a complete surprise to us, as Nparks had never mentioned any issues to the association since the trail was open to recreational use in May 2013. While we have managed to get Nparks’ commitment that they do not have to make a decision right now, chances of them changing their mind are next to none. Nature Society Singapore (NSS) has also given their public support for the closure, an almost-final nail in the coffin of sorts. But all is not lost. The patient is not dead yet. Both Nparks and NSS cite erosion and conservation reasons for the closure, and use the future opening of Chestnut Nature Park’s mountain bike trails as a substitute to Butterfly trail. As a mountain biker, you understand Butterfly trail is unique and irreplaceable. Your Mountain Bike Association has worked hard for the opening of Butterfly trail to recreational use, and will continue to fight hard to keep it open until all options are exhausted. The only way we see Nparks changing its mind is if it is petitioned by members of the public, and comes under pressure by elected representatives of our government and parliament. An outpouring of public support will help bring awareness to the high handed nature of its impending closure. The press has drawn awareness to the closure of the trail, and we are now ready to leverage the exposure with our action plan below. The fate of Butterfly lies in your hands now, and the association has created three simple tools you can use to make your voices heard by those who serve the country on your behalf. Please pledge your support and ask your friends to do so. Share your signed petition on Facebook. It takes less than a minute of your time. The association has created some templates which you can use, depending on your citizenship. Please feel free to amend and edit them as necessary. For Singaporeans, we recommend that you leverage your status as a voter to petition both your member of parliament, GPC Chairman for National Development and Environment, and the Minister for National development. You can find the templates here. If you are unsure of which constituency you are in, or who your MP is, this will guide you. For non-Singaporean residents, we recommend that you petition Nparks directly using this template. One of the reasons behind the success of NSS is because their members petition the government on major environmental and conservation issues. We have created these templates so that is is very easy for you to send these letters out. This should take less than 5 minutes of your time. It would be even better if hou can also ask 5 pf your mountain biking friends to do the same by forwarding this email to them. Let us flood MND and Nparks with such a show of support that they will rethink the the closure of Butterfly trail! If you take all of the action steps listed above, it should take you no more than 10 minutes, but will mean a world of exponential difference to our efforts. We implore you to help save trail access at Butterfly, and ask your friends to help too! Wishing you happy trails ahead.